Traveling with urinary catheters can be a bit intimidating, especially for people who are new to cathing. 180 Medical likes to keep our patients well informed, and up to speed with the latest urological research, news, and tips. One of the first things to do is to contact the airline you will be traveling with and inquire if the airline has any special procedures for traveling with catheters. The airline should advise of procedures you should follow. 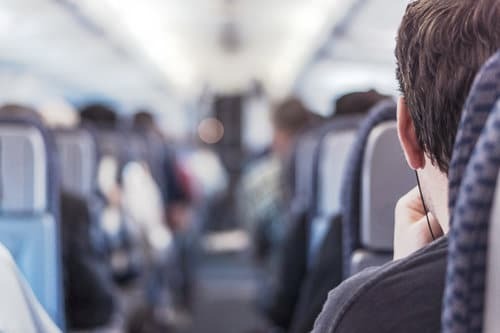 Ask if the equipment you bring on board meets Transportation Security Administration (TSA) guidelines and follow some basic hygiene steps during the flight. I have never had a problem with the airlines questioning why I am carrying the catheters and supplies, but if you are concerned you can always contact the airline you are traveling with and let them know. TSA has established air travel laws and regulations pertaining to liquids. For carry-on bags, you must place all liquids of 3.4 oz or less must fit on one quart-sized, clear, plastic zipper-lock bag. If your catheters have a water packet, they would need to be placed in the clear bag. Since medications are an exception to the rule, the catheters with water packets might be okay with doctor documentation, but check with the airline beforehand to make sure. If you have lubricant, make sure it is 3.4oz or less, and it would also need to go in a clear plastic bag. For those who use lubricant with their catheters, the airline should be okay with it as it is required to catheterize. You should not be limited on how much you can take, but keep it with your catheters so it will be more apparent what it is used for. I have not had a problem with leakage, but it might not be a bad idea to put the lubricant into a plastic bag. On top of carrying enough catheter supplies in your carry-on baggage to last you until you get to your destination (plus a few extra), I suggest packing the majority of your supplies in your checked luggage. This way you don’t have to worry about carrying around the extra load. Another handy idea I’ve done before when staying somewhere longer than a few days is shipping my supplies to my destination. 180 Medical is glad to handle shipment to your destination for a long-term stay with notice before your shipment is scheduled to go out. I always say better safe than sorry, especially when it comes to medical supplies that we need to empty our bladders! Count the number of catheters you will need for your trip depending on how often you catheterize and how many days you will be gone. It is a good idea to take enough catheters to last a few extra days in case of unforeseen circumstances. This also includes lubricant and other supplies you use to catheterize. Many people prefer to use a more advanced catheter, such as closed system catheter kits, while traveling to try and reduce the chance of getting an infection. These catheters do not require lubricant and some are designed to where you don’t even touch the catheter which are called closed system catheters. Some people whose insurance will not cover them often purchase them just for traveling. When you’re away from home, you can’t always guarantee the sterility of your environment. It’s likely you’ll be cathing in public restrooms. So I suggest taking another some antibacterial wipes to clean your urethral area and your hands before cathing. For more information and travel tips, visit the Transportation Security Administration website.